One of the biggest faults of multi-tablers is that they try to move up tables too quickly. But rather than worrying about how many tables you’re playing, you should concentrate on win rate and move up slowly. 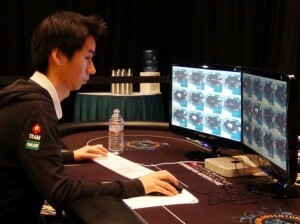 When playing 10 tables or so, you don’t have time to analyze each player at every table. So HUDs can help you quickly identify which players are loose and tight. Keep your phone away, TV off and distance yourself from any other distractions. After all, it’s nearly impossible to focus on many tables when you’re worried about what your latest text says. Rather than wasting time clicking the bet, fold and check buttons in the exact spot, hotkeys help you do this with a simple keystroke. Using hotkeys can even be helpful for bet sizing, such as a 3 big-blind bet for example. Tiling tables is better because it gives you a better visual of all the action. Stacking, on the other hand, makes it more difficult to follow each street on every table. If you’d like to see Nanonoko explain these tips in their entirety, please visit PokerListings and watch the multi-tabling video.